Where would you find a scintillating blend of impeccable French culinary technique and a uniquely Asian sense and sensibility? 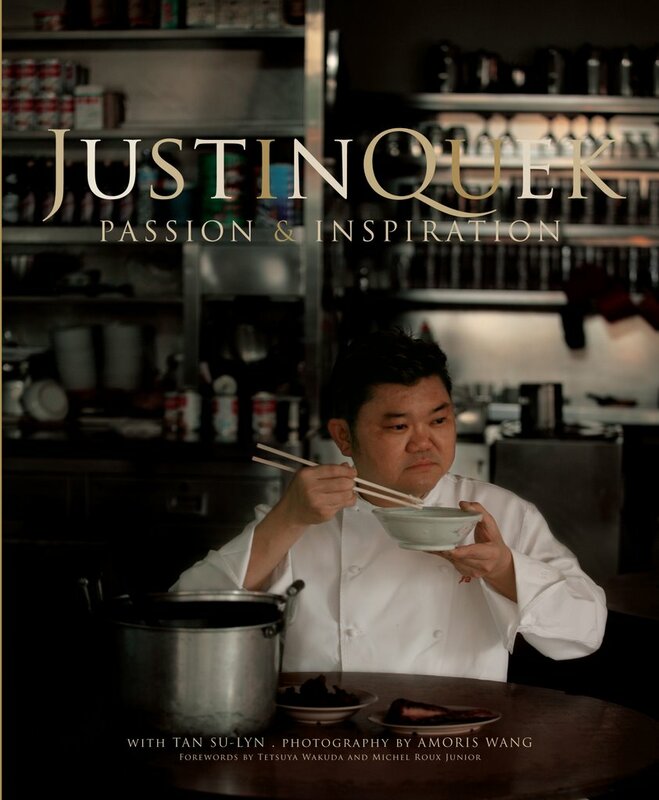 For many (and not just those of us lucky enough to reside in Southeast Asia), the answer lies with Justin Quek, widely acclaimed as one of the best French chefs Singapore (and Asia) has ever produced, and La Petite Cuisine, his much-beloved restaurant in Taipei. And now, thanks to the publication of Justin Quek's Passion & Inspiration, longtime fans and the recently initiated alike can find it between the gorgeous covers of what is surely this year's most exciting and eagerly anticipated cookbook by a Southeast Asian chef. Page after page, the chef's passion and steadfast commitment to the quest for perfection shine through. The avid cook will be inspired, to say the least. The high production values will come as no surprise given as there was the culinary equivalent of a SWAT team working on the book, including author Tan Su-Lyn and media consultant Aun Koh, also known as some of the food blogosphere's finest - the husband-and-wife team behind Chubby Hubby. My praise is unstinting, and not only because I happen to be Singaporean or CH & S happen to be dear to me - that having been said, if you were in my shoes, wouldn't you be pleased as Punch too? But don't take my word for it - the book has been lauded by the supernova likes of Ferran Adrià, Charlie Trotter, Neil Perry, and Pierre Hermé, with glowing forewords written by Tetsuya Wakuda and Michel Roux Junior. Tagliatelle with Fresh Summer Truffles and Sauteed Pork Neck Confit, Lobster Bisque Herb Souffle, Parfait of Goose Foie Gras with Black Truffle Jelly and Caramelised Filo, Tartare of Langoustines with Smoked Caviar and Vodka Cream...a mere glance at the recipes for the decidedly modern French food Chef Quek is known for will give you an inkling as to why he's put Singapore on the globe-trotting food-lover's map. But as much as I gravitated to such, the recipes which really spoke to the true blue local girl that I am were the ones with a distinctly Asian bent. Think Crab Beehoon, braised in an aromatic broth, inspired by a street food favourite by Chef Quek's favourite hawker, Tian Jin Hai Seafood. Or Chinese Herbal Duck Consommé with Wild Mushroom and Black Truffle Tortellini, a decadent take on the delicious soup known as bak kut teh which the chef aptly describes as "a Southeast Asian pot au feu". And of course, Hainanese chicken rice - a dish virtually synonymous with Singapore - makes an outing in the elegant form of a Singapore-Style Chicken Rice Salad, vibrant with the unmistakable flavours of soy sauce, sesame oil, ginger and coriander. And it's not just hawker and street fare that have been transformed by the chef into incredibly refined dishes appropriate to a restaurant context. There're also the comforting homespun classics, such as ngoh hiang, traditionally a Teochew speciality, adopting a voluptuous aspect as Deep-Fried Duck Foie Gras Roll in Beancurd Skin. When I saw the recipe for Lobster Laksa, I knew it would be the first recipe I had to try. 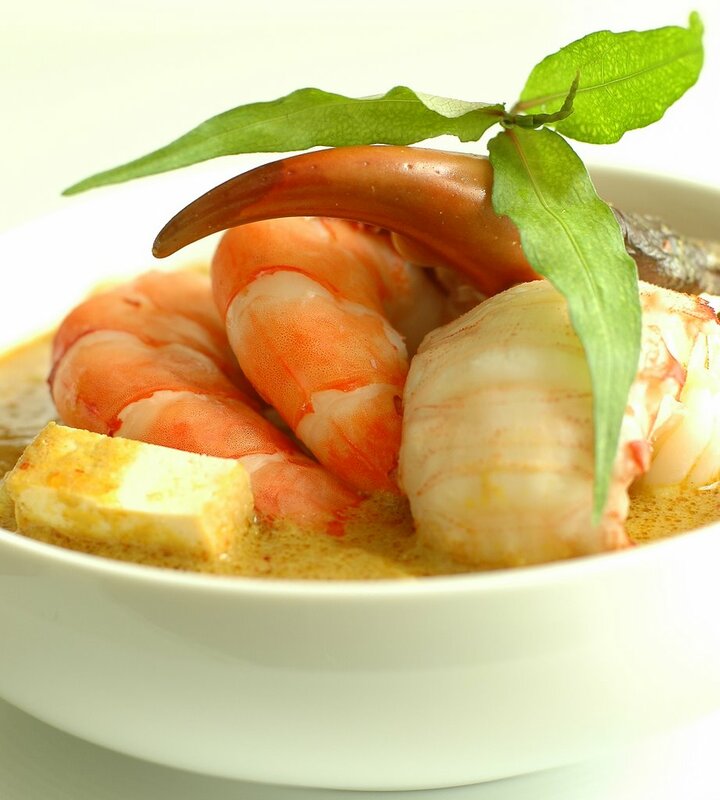 I love laksa lemak, and Chef Quek's ultra luxurious version uses lobster in lieu of prawns. I didn't have the time to track down Maine lobsters, so used a combination of slipper lobster, crab and jumbo king prawns instead. By being extravagant with the choice of seafood, practising restraint with noodle portions, and taking the time to craft a rich, luscious and deeply savoury broth based on freshly pounded rempah, homemade chicken stock and just-extracted coconut milk, the simple enters the realm of the sublime. 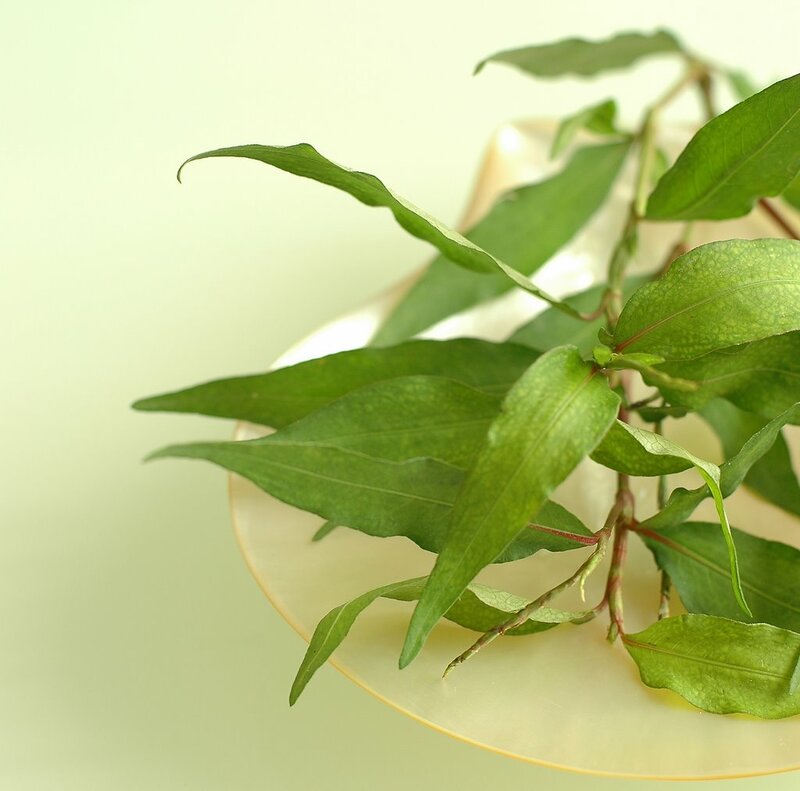 What is well worth the effort tracking down is the polygonum odoratum leaf, which is also known as hot mint or Vietnamese mint (rau răm, often part of the bouquet of fresh herbs served alongside the noodle soups and spring rolls of Vietnam, Cambodia and Laos). In Singapore - where no laksa is considered complete without it - polygonum is known as daun kesom or daun laksa (the latter means "laksa leaf"). Despite what some of its monikers may suggest, polygonum bears little resemblance to mint whether in terms of looks, flavour or scent. The herb boasts a zesty and intensely peppery bite that counterbalances the fat, creamy character of the broth. I'm fascinated by laksa, maybe because I live in the part of the world where I've never seen it on a restaurant menu. I don't know about this type of hot mint either, sounds very interesting. Sigh. I continue to adore your photography. It's such a gift to the world. Yum! That is one heavenly looking laksa, a fabulous meal in a bowl. Yum! Looked like a luscious bowl of laksa indeed! And I love Laksa Leaves - one of Asia's wonder herb! I can just taste those prawns... so pretty. Wow. I really have to try Chef Quek's restaurant the next time I'm in Taipei. His food sounds wonderful. I neer leave this blog hungry! You fill me with such amazing inspiriation! Thanks for also being a cookbook addict like me! This one sounds really special, but I'm afraid the ingredients would be out of reach for most Americans. I will just have to visit Southeast Asian to try for myself. I've heard quite a bit about this book lately. This dish looks amazing! This bowl really looks sinfully delicious! Awesome! You cannot do this to me Jocelyn! I had promised to myself "not" to buy a new cookbook, and here you are, with this goegeous dish and attractive book review. What can I do??? lobster + laska really why wouldn't you make this first?! I've only recently discovered laskas while in Vancouver. (hey I'm transplanted from Boston!) I'm hooked! How I would like some right now. I guess I'll settle for the book. ;-) Very nice! Hi J, isn't it a gorgeous book? I've been looking at it for two weeks trying to decide what to make from it, but there are just too many tempting things. I was actually eyeing the laksa too, but I don't think I could have pulled it off nearly as beautifully as you have! Submit your blog to our Food Blog directory while your there! yup, laksa is one of the most delicious noodle you can get on the face of the earth :-) Coming from Malaysia myself, laksa is indeed very common and comes in a variation of recipes. And yup, you can't get a good laksa, not without the daun kesom- a must-have ingredient! 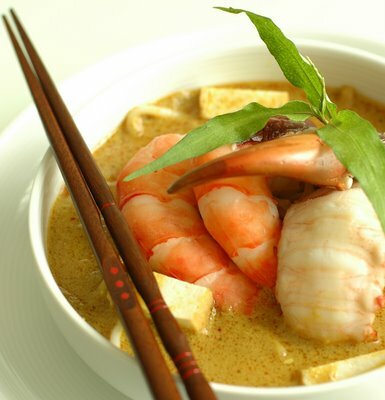 oh yeah..your laksa looks absolutely yummy! Having lived in S'pore for 5 years, I couldn't get enough of the 'laksa' dish (curry laksa, laksa lamek, assam laksa)! Your write up has made me think it's time to make another! what is slipper lobster like?